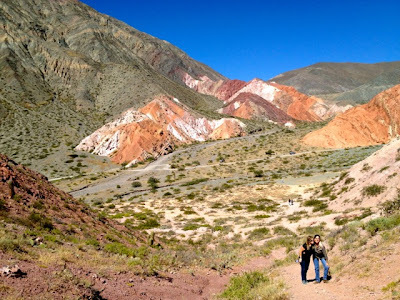 Tilcara (elevation 8,000 ft) is located in the Quebrada de Humahuaca, which is a huge area of massive valleys with hundreds of miles of spectacular scenery and very few people. It's high, arid country, but it receives enough rainfall occasionally to cause significant erosion of the sedimentary rock which then displays an incredible variety of colors. All of the photos in this post were taken in Purmamarca, which is just 10 miles south of Tilcara. 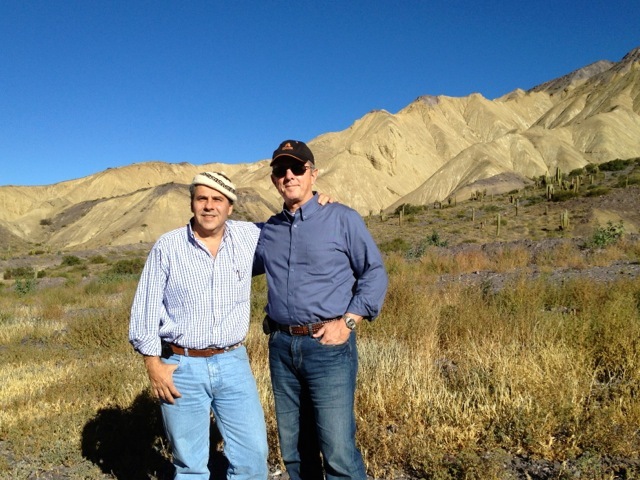 Tilcara is the more established town, but Purmamarca has the more spectacular views. The shot above is the approach to the town, which lies at the foot of multi-colored mountains that are breath-taking. Most tourists don't see this view, since you have to skirt around the edge of the town and go up a narrow dirt road for a mile or two. 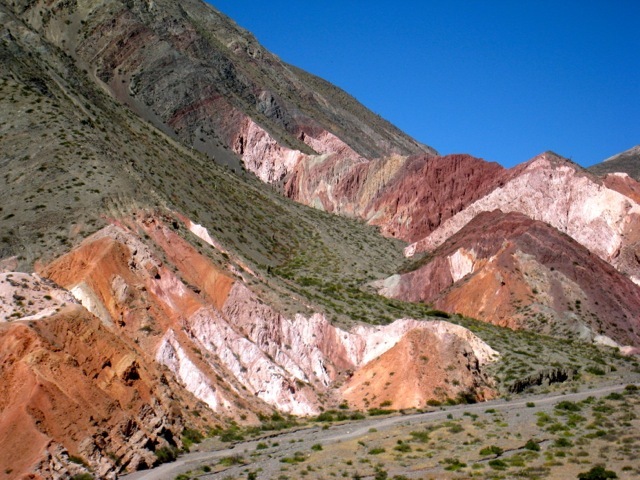 The variety and intensity of the colors are something to behold. Another shot of the back country, taken from higher up. And yet another shot, to put it into better context. 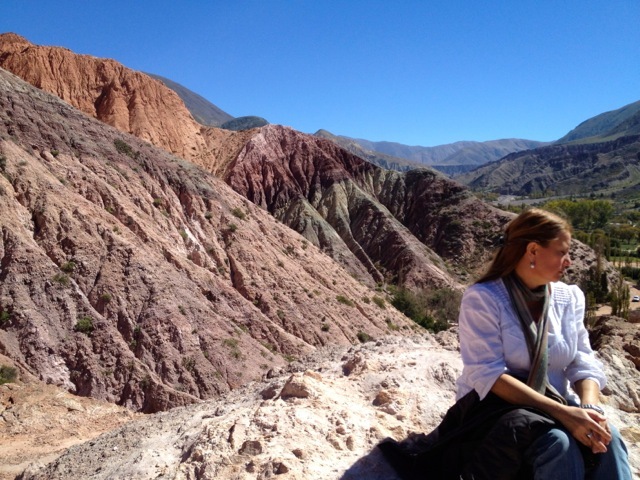 Here we are sitting at a spot that overlooks the town of Purmamarca. The mountains on the left display a subtle but wide range of color. Recent rainfall has given the mountains in the distance a hint of green. Adjacent to the town is the hotel "Manantiales del Silencio," which is undoubtedly the classiest and most luxurious of all the hotels in the region. 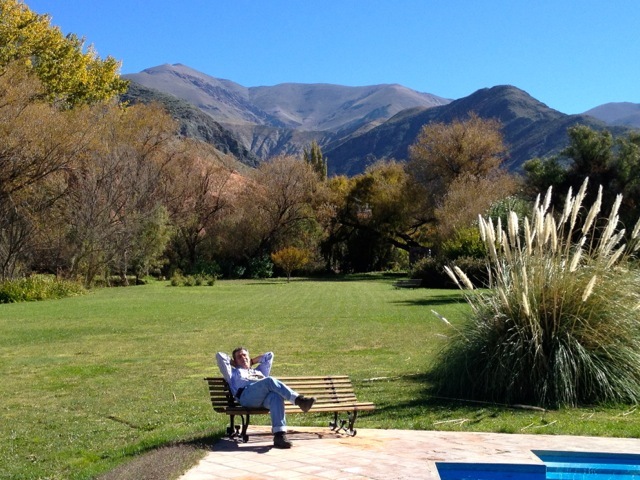 We had a fantastic lunch there, and then relaxed in the gardens out back, which enjoy views such as you see above. 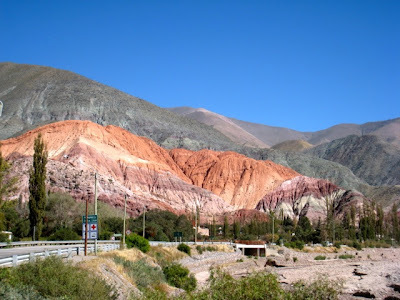 This hotel was the choice of Prince William of Holland and his wife, Princess Maxima (Argentina's most favorite homegrown celebrity) when they came to the area not too long ago. A room for two is pricey by the standards of the region, but costs only about $200 a night, including breakfast. (We tried to get a room but their 12 rooms were booked solid.) There were a number of very nice-looking hotels that we saw in and around Tilcara, and I imagine you can get a great room for around $100. 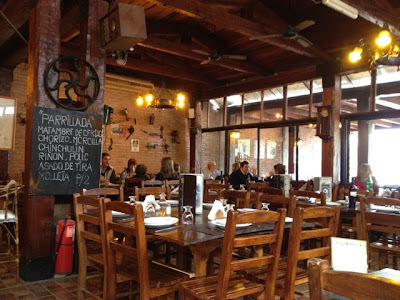 Tilcara also has a surprising number of nice-looking, small, and very charming hotels and restaurants. The photo was taken about 15 miles west of Purmamarca, just off the highway that goes to the Paso Jama that leads to Northern Chile. It's difficult to capture the beauty of some features of the landscape. The mountain in the background of the above photo almost looks like it were made of a golden brown ceramic. Note the hints of purple in the middle area. 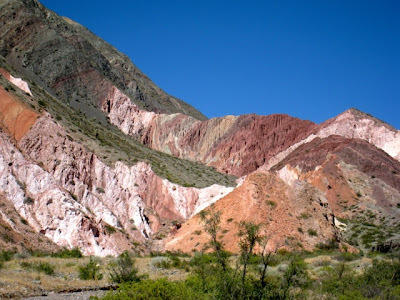 My point with all these shots is to emphasize the highly unusual, colorful, and varied nature of this unique part of the world. You could spend an entire week exploring. 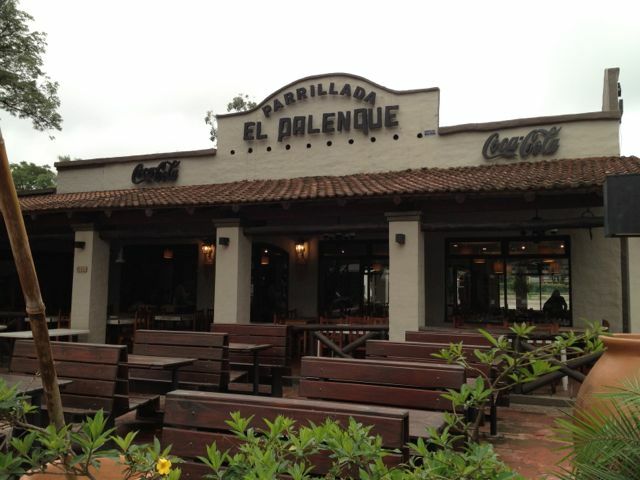 The accommodations are very nice and very reasonably priced, the food is very good, and the people are very friendly. I was surprised that we didn't run across a single American tourist either yesterday or today. 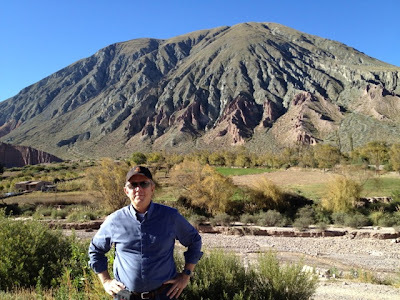 Most of the tourists are young Argentines. I'm told that it is best to avoid the summer months (Jan-Mar) because the youth population reaches disturbing proportions. Winter months can be cold (tonight it's about 38-40º outside), but the sky is almost always bright blue. My wife's hometown is Tucumán, a medium-sized city in the northwest portion of Argentina. It's mostly known for its agriculture, especially oranges, lemons, sugar cane, and soybeans. There's a decent amount of poverty in the countryside (which is lush and green most of the year), but the city is bustling, and even bursting at the seams as traffic in the downtown area has become unbearable in recent years. The people here are fantastic, but they lead a chaotic life by American standards. Due to summer heat the city observes a "siesta" schedule, so every day people must commute twice: work hours for most offices are from 8 am to noon, and from 4 pm to 8 pm. Nearly everyone comes home for lunch, many then take naps, and then it's back to work only to come home again late in the evening. Most stores follow the same schedule, which means that your shopping day is interrupted if you get a late start. The national pastime is talking with friends over a coffee, which is why Argentina has coffee shops on every block just like the U.K. has pubs. On Friday and Saturday nights its common to go out to dinner around 11 pm or even later, and no one gets back home before 2 or 3 in the morning. Young people are completely out of whack, since they wouldn't even consider going out for the evening before midnight, and the boîtes (mainly for music and dancing) don't open until 1 or 2 am. It's similar in many ways to the night life in Spain. Teenagers are in the habit of staying out until 7 am on Saturday morning, since that way they can take a bus home. We're going to a wedding tonight, in fact. The church ceremony starts a little after 9 pm, followed by a huge bash at a special event site in the foothills. 550 guests are invited for the cocktails, hors d'oeuvres, and dinner, and another 200 are invited to come around 1 am for the dancing, which could last through breakfast. Our daily routine usually goes like this: since we almost never get to bed before 3 am, we wake up at 9 or 10 am, have some coffee and a roll, run some errands and check the computer, then meet some friends for lunch around 2 or 3 pm. I might take a short nap while my wife goes out for tea with some friends around 5 pm. More errands or shopping, or just having a coffee with a friend, then out to a restaurant or a friend's house for dinner. Last night (Thursday night) our friends picked us up at the hotel at 10:15 and we sat down to a delicious asado (bbq) at their house at 11:30. They took us back to the hotel a little around 3:30 am, and most of them had to work this morning!! There were about a dozen at the table, and the conversation ranged from politics to economics to jokes. They were all struck by the similarities between Obama's policies and tactics and those of Cristina Kirchner, their own president. They are all very worried that Argentina is headed for another disaster, and it probably is, if only because there are no longer any effective checks and balances on the power of the presidency; the Congress is a rubber stamp, and the courts are famously corrupt. Sadly, there's not much they can do except grin and bear it. 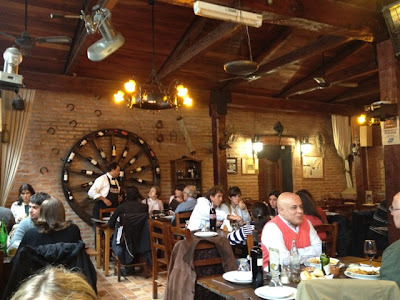 The photo above is a place just up the street from our hotel where we had lunch at a few days ago—a typical Argentine parrillada that serves barbecued meat, chicken, etc. 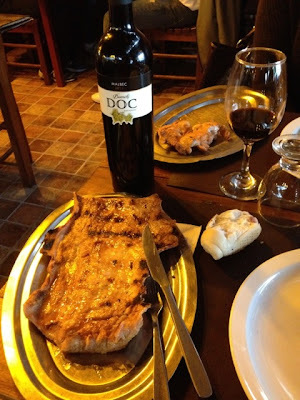 A bottle of very nice wine cost $13, a huge steak that we shared (my favorite is the picana) was $11, a big mixed salad was $3, a side of french fries $3. Food is still cheap in Argentina, and it's very good. 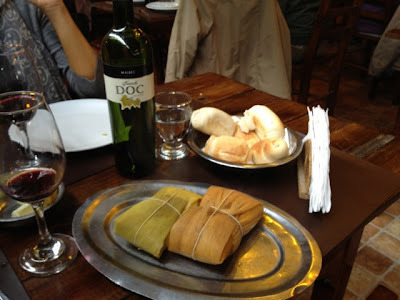 My wife's two favorite things: an Argentine-style tamale, and humita en chala. The only thing the former has in common with a mexican tamale is the corn meal inside and the corn husk outside. The latter is a corn husk wrapped around a mass of fresh ground corn cooked with spices and cheese. The wine was a Bianchi DOC Malbec, one of the best Malbecs I've had, and it only cost $8! Unbelievable. This huge slab of meat is matambre de cerdo, a juicy and delicious piece of pork taken (I think) from just next to the ribs. Almost impossible for a normal person to eat the whole thing, and it only costs $12. I had never had it before but surely will again. Los Hornos is best-known for its empanadas, the best by far being the empanadas de carne picante. $1 each, and I couldn't eat more than three. I've had empanadas all over Argentina and in many parts of the world, but these are the gold standard against which almost every other empanada fails. 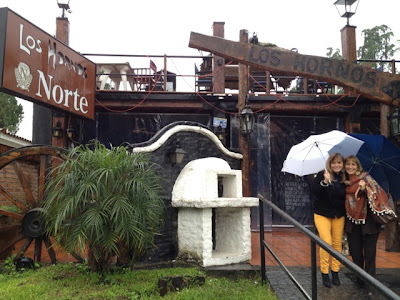 Los Hornos is nothing fancy, just good old rustic atmosphere and great food for a very reasonable price. It's got some huge brick and clay ovens that do nothing but churn but plates full of empanadas. The blackboard in the top photo above describes a parrillada for two: a portable bbq is brought to your table, piled high with the pork cut I mentioned above, chorizos (italian style sausages), morcilla (blood sausages), chinchulín (small intestines), riñon (kidney), and asado de tira (ribs). Way too much for two people to eat, and it only costs $22. 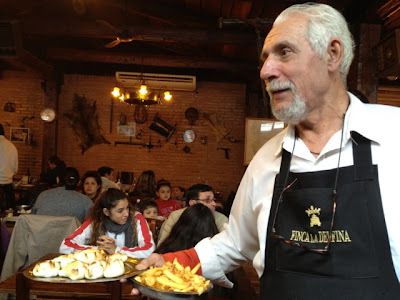 You won't find a parrillada this good in Buenos Aires, but the Don Julio restaurant in Palermo Soho I mentioned in an earlier post comes close, only much more expensive. According to the government's first estimate of Q1/12 GDP growth, the U.S. economy grew at a 2.2% annualized rate, a bit less than the 2.5% expected. In numbers, that shortfall from expectations works out to about $10-12 billion, and that is essentially a rounding error. The government is going to revise its growth estimate several times in the future, and the final number could be a lot more—or a lot less—than what these charts show. 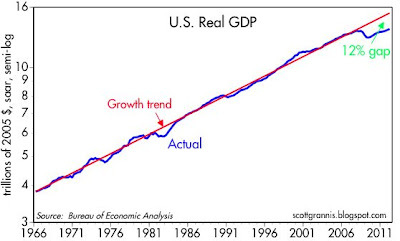 One thing that won't change, however, is the fact that the U.S. economy is growing by much less than it should be, given the degree to which it suffered in the last recession. The top chart above is my attempt to quantify that underperformance, which I'm guessing is 12%, or about $1.8 trillion. That's a lot of income that should have been recovered by now. 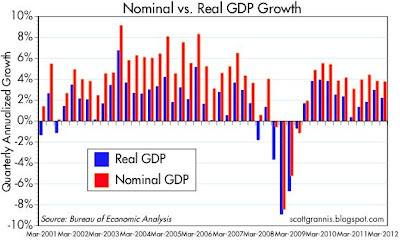 This next chart shows that the the economy has been growing at a nominal rate of about 4% for the past seven quarters. Nominal growth has been fairly constant, but real growth has varied significantly over that same period. On balance, the economy has been muddling along, not doing anything very impressively. 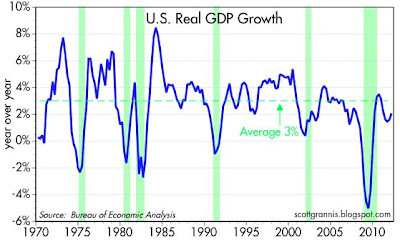 Before the current recovery started, I thought the economy would post 3-4% growth, which at the time qualified as a "sub-par" or disappointing growth forecast given the depths of the recession. 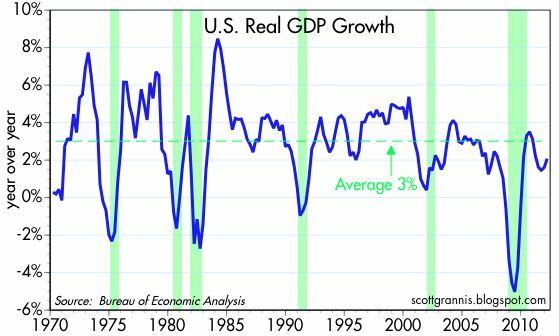 Instead, the economy has posted 2-3% growth on average (to be exact, real GDP has grown at a 2.4% annualized rate since the middle of 2009). My projection was relatively pessimistic at the time from an historical and theoretical perspective, but it turns out I was a bit too optimistic relative to the ensuing reality. Nevertheless, I have resisted the double-dip recession fears which have arisen a few times in recent years (most recently last Fall), and so far I've been right on that score. I still don't see signs of an impending recession, and I continue to expect sub-par growth. But in the end, whether growth is 2.5% or 3.5% makes little difference, I suspect, since my reading of the market tea leaves (notably the 2% yield on 10-yr Treasuries and the below-average PE ratio of the S&P 500) suggests that the market is not even priced to 2% growth. 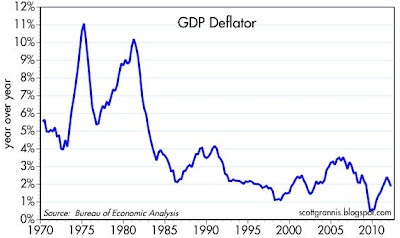 The next two charts show inflation as measured by the GDP deflator, the broadest measure of inflation. The first chart shows the year over year growth of the deflator, whereas the second shows the quarterly annualized growth of the deflator. Inflation by this measure has averaged about 1.4% per year over the past three years. That's pretty tame, and about as low as we've seen for quite some time. But it is only slightly below the 2% upper range the Fed is targeting, and there are no signs that deflation is threatening. Which brings me to the elephant in the room. The fact that we have not experienced any deflation (expect for the Q2/09 quarter, during which the deflator fell at a modest, 0.5% annualized rate), despite the magnitude of the recession and the huge 12% output gap which has prevailed for some time, is really big news. The prevailing theory of inflation (embodied in the Phillips Curve), which the Fed shares, is that it should vanish or turn negative if the economy were to experience a huge output gap for several years, such as we have experienced. Instead, inflation has been about the same in recent years as it has been for the past two decades. This probably should be a testament to the brilliance of Fed Chairman Bernanke, but the Fed's record of keeping inflation low on average has been marred by the relatively high degree of inflation volatility that we have seen in the past decade, as highlighted in the second chart: inflation has varied from a low of -0.5% to a high 4.7%. Given the nasty recession and painfully slow recovery we've been through, it's tempting to forgive the Fed this error, except for the fact that it's unsteady hand on the inflation tiller likely contributed to the 2008 recession. In any event, the record of recent years is good evidence that the Phillips Curve theory of inflation has not done a good job at all of explaining or predicting the behavior of inflation. It's never made sense to me that inflation should be a function of the strength of the economy, or of the level of unemployment, or the degree to which resource slack exists. Inflation is a monetary phenomenon, pure and simple, and central banks therefore are the primary source of inflation. As a corollary, while central banks have the ultimate control over our inflation destinies, they have very little ability to create real growth. Good monetary policy can contribute to growth by promoting the stability of a currency and thus bolstering the confidence of investors, but it can't just create growth out of thin air by artificially lowering interest rates or running the printing presses. 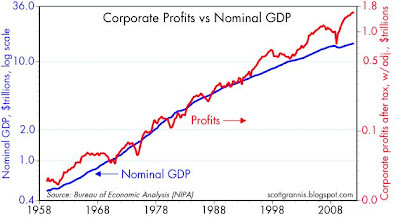 In the end, real growth only occurs when the resources available to the economy (e.g., capital, labor, raw materials) are put to work in a manner which increases total output. The federal government is also very limited in its ability to generate real growth, since spending money on more bureaucrats or more transfer payments doesn't do anything to create more output, and more likely results in greater inefficiency and thus less output. Generating more output from scarce resources is where the private sector excels. It's hard for an entrepreneur to figure out get more out of a given amount of resources, and working more hours is hard too. Working hard or harder generally requires giving people an incentive to do so, and the profit motive operating in free markets is what has proven to work best. So if we're looking for a reason why the economy is 12% smaller than it otherwise should be, we shouldn't be looking at the Fed. I think one obvious source of the shortfall is the huge increase in government spending in recent years, most of which has been in the form of transfer payments. Instead of allowing the private sector to utilize the trillions of dollars the federal government has borrowed to fund this increased spending, the government has effectively just taken the money from the pockets of those who have been productive and put it into the pockets of those who have been unproductive or less productive. That doesn't create growth, it just wastes our scarce resources, because—as Milton Friedman taught us—nobody spends other people's money as wisely as they spend their own money. It's as if the government simply directed all of us to pour some of our hard-earned money down the toilet by buying things we don't need. Weekly unemployment claims have ticked up in recent weeks, but this is likely part of the normal signal-to-noise ratio that comes with this series. On an unadjusted basis, claims are down 5.5% from a year ago; on an adjusted basis, they are down almost 9%, and both those figures are consistent with the declining trend we have been observing for some time now. The number of people receiving unemployment compensation is down 16% (almost 1.2 million) in the past year, and this is significant. On the margin, fewer people receiving unemployment benefits means more people are working and more people have a greater incentive to find and accept jobs. 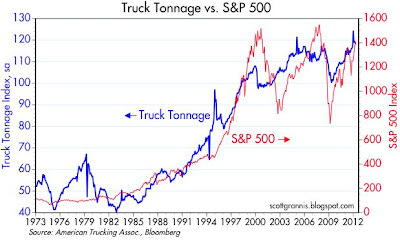 Truck tonnage has risen at about a 4-5% annual rate for the past few years. Over the past six months (abstracting from the apparent distortion in the December data), truck tonnage is up at an annualized rate of just over 6%; no sign of any recession here—just continued moderate growth. 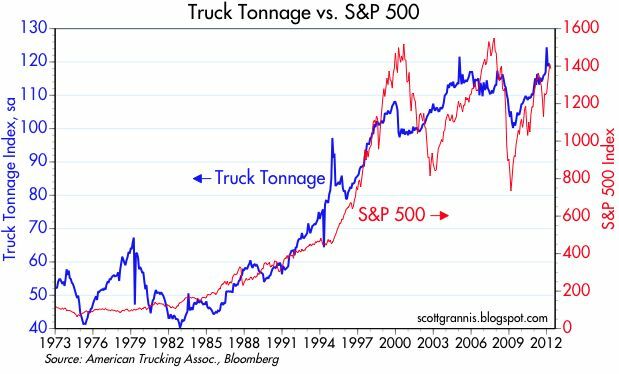 As the top chart shows, truck tonnage and equity prices tend to move together, since both are tied to the health of the economy. Calculated Risk has the story in greater detail. 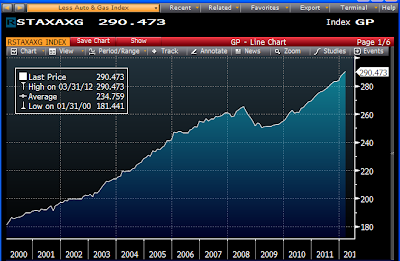 Let's start with swap spreads, excellent and leading indicators of systemic risk. 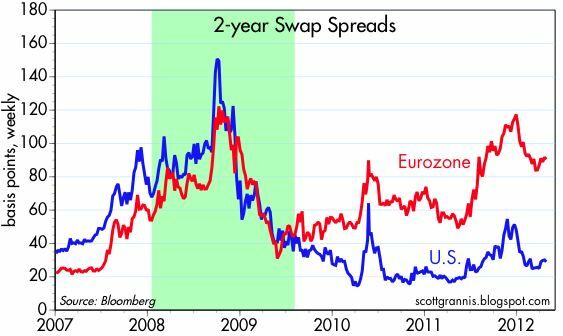 This chart shows that the U.S. first decoupled from the Eurozone in mid-2009, as U.S. swap spreads fell while Eurozone swap spreads rose. We got a hint of contagion in the second quarter of 2010 when all swap spreads spiked (in response to the first eruption of sovereign default risk), but U.S. spreads quickly settled back down. We saw another hint of contagion in the second half of last year, as the Greece default disease reached its climax, but once again the U.S. fundamentals improved even as Eurozone conditions remained fragile. U.S. swap spreads are still firmly within a "normal" range, but Eurozone swap spreads are still quite elevated. The Eurozone has avoided a financial meltdown—thanks to aggressive easing by the ECB—but default risk remains high because too many countries in the Eurozone have bloated governments that are strongly resisting the need to go on a diet. Capital flight, the risk of increased tax burdens, and fears of a Euro breakup have weighed heavily on European economies. 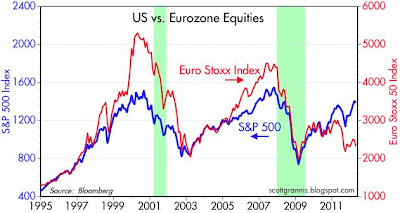 Comparing the performance of U.S. and Eurozone equities (above chart), we see that the true decoupling of the U.S. and the Eurozone began in 2010, as U.S. equities marched irregularly higher, while Eurozone equities marched irregularly lower. The chart above shows the ratio of U.S. equities to Eurozone equities. 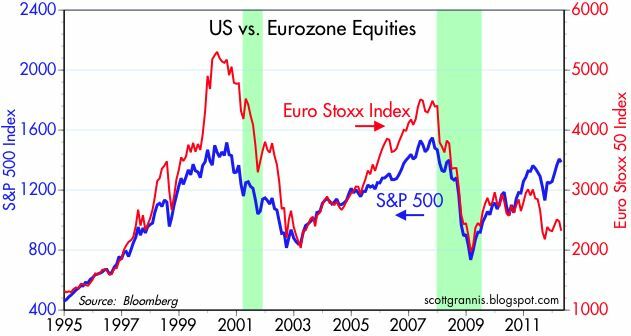 Since early September 2010, U.S. equities have outperformed their Eurozone counterparts by over 50%. 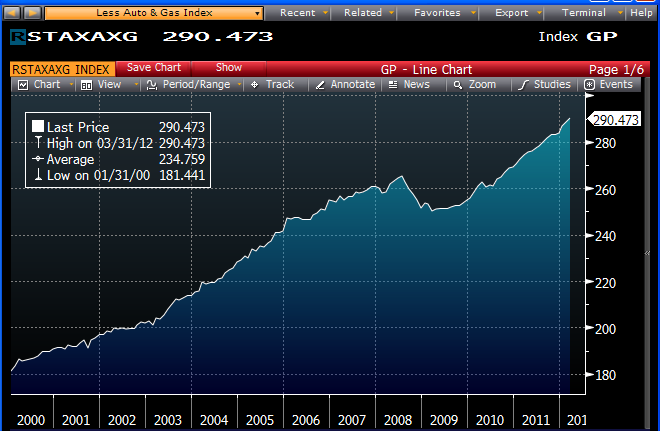 That's a pretty solid indicator of just how immune the U.S. economy has been to catching the Eurozone flu. It's actually very impressive. To be fair, I should acknowledge that the U.S. has benefited significantly from the dollar's reserve status: with the future of the Euro in doubt, the dollar becomes the default currency for just about anyone seeking a safe haven these days. 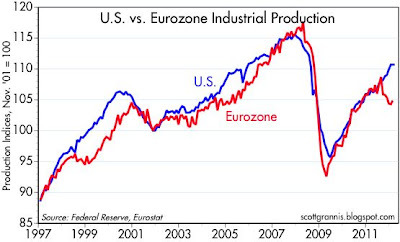 The U.S. economy has indeed benefited from significant capital inflows from Europe, as the above chart suggests. Moreover, even though the U.S. fiscal picture is not much better than the Eurozone's in aggregate (all major economies have a severe over-spending problem it seems), the size of our federal debt does not necessarily pose a risk to the dollar, just as Japan's monstrous government debt has not hurt the yen. The same cannot be said for the Eurozone, since national governments there are not free to inflate or devalue their way out of their debt morass, leaving a breakup of the euro as one viable—but not very attractive—option. The U.S. has one more thing going in its favor right now, and that is the growing likelihood that the November elections will reveal that country is getting serious about attacking its deficits. We have already benefited from a major shift in the balance of power in Congress, and now a change in the presidency looms. To make the point clear: Obama's recent budget proposal called for increased spending, higher taxes, and trillion dollar deficits for years to come, but not a single House Democrat was willing to vote for it. Obama and Harry Reid in the Senate are among the shrinking number of Washington politicians who still believe that the way out of our current mess is to spend and tax even more. Knock one or both of them out and the balance of power in Washington and the thrust of fiscal policy can change dramatically. One important caveat: there is a good way and a bad way to practice fiscal austerity. Europe so far has been attempting to pare deficits through a combination of tax hikes and spending cuts, but this does not inspire confidence: tax hikes in the midst of a recession are not only politically difficult to implement, they can aggravate the weakness (the U.K. has already abandoned its attempt to boost taxes on the wealthy because it failed utterly to produce higher revenues) and that creates a negative feedback loop that can push deficits even higher. The U.S. is toying with tax hikes, but I don't seen any meaningful chance of that happening. It's far more likely that the U.S. federal deficit will continue to decline relative to GDP (as it has for almost two years now) thanks to spending restraint and continued moderate growth. If the U.S. can achieve some significant tax reform (e.g., broadening the base by eliminating loopholes, deductions, and tax subsidies, in exchange for lowering marginal tax rates, plus cutting the corporate tax rate meaningfully), then the resulting stronger growth could do wonders for deficit reduction. Another refreshing wind of change blowing through Washington these days is the growing perception that government spending does not stimulate an economy, and can in fact weaken an economy. Keynesian theory has suffered what could prove to be a fatal blow with the failure of the Obama stimulus to boost the economy as advertised. If enough politicians come around to the realization that cutting spending (or at least not increasing it) can prove beneficial for growth, then "austerity" becomes a good thing. I'm not holding my breath for a development like this anytime soon, but I think that on the margin we are moving in that direction. And markets are always very sensitive to change on the margin. 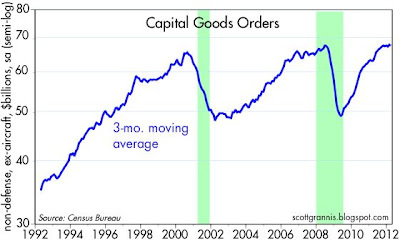 Capital goods orders no longer stand out as a bullish indicator for the economy. Orders have been flat for the past six months, although I note that there have been lots of upward revisions along that have turned from what looked at first like a slump into what now looks like simply a flat trend. Capital goods shipments (above chart) have continued upwards, however, and this matters because this is the measure of capex that counts for GDP. Still, orders are the leading indicator for GDP, so this is not much to be excited about. On balance, the recent lack of growth in capex subtracts somewhat from my long-held optimism that the economy will continue to grow, albeit at a disappointingly slow pace, but it is not something that points to recession. 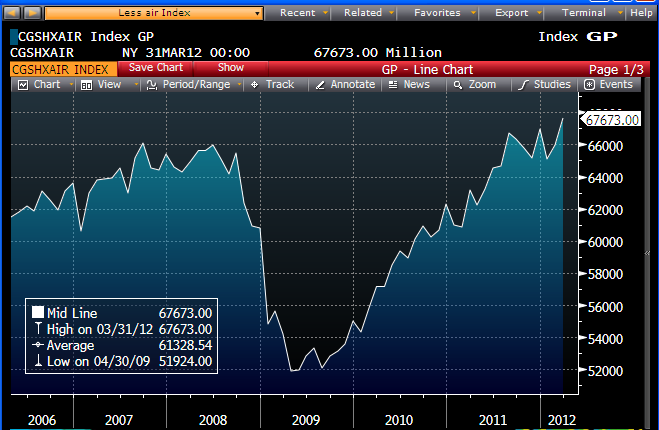 I take it as simply an indicator that the economy is likely growing a bit less than I thought. 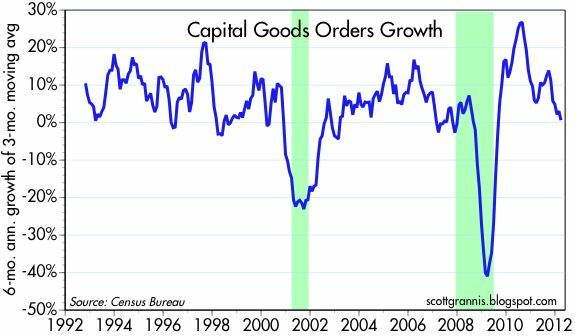 The second chart above shows that capex growth has slowed to zero several times in the past without signaling a recession. Given that the market still remains burdened by fear, uncertainty, and doubt, flat capex is probably better than what the market has been priced for, so I doubt that it creates downward pressure on equity prices. 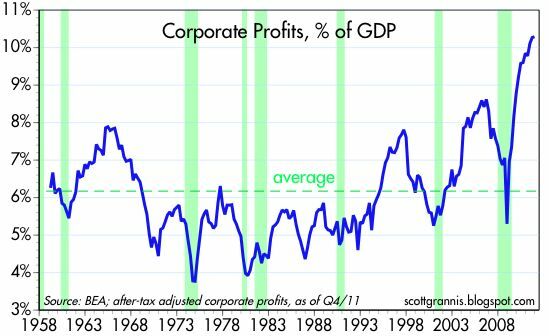 And indeed, the market is up today because the news on corporate profits continues to be better than expected, and that is a very bullish indicator for the economy going forward. This America [I see] is fundamentally fair. We will stop the unfairness of urban children being denied access to the good schools of their choice; the unfairness of politicians giving taxpayer money to their friends’ businesses; the unfairness of requiring union workers to contribute to politicians not of their choosing; the unfairness of government workers getting better pay and benefits than the taxpayers they serve; and we will stop the unfairness of one generation passing larger and larger debts on to the next. Fairness has to do with equal opportunity, not with equal results. Getting ahead means working hard, not getting handouts from the government. We celebrate those who are successful; we don't envy or begrudge them. These are the values that I believe resonate with the American people. I think Romney is off to a very good start, and that makes me optimistic. Obama is on the wrong track, pitting rich against poor and black against white, blaming banks and big corporations for our problems, expanding the role of government instead of shrinking it, and insisting on playing Robin Hood with higher taxes on the rich. The November elections pose a monumental choice to the American voter, a choice that will have profound consequences for the future of our country and our economy. Politics can fundamentally alter economies and markets, and this year I believe our political choices will matter more than at any time in my lifetime. Above: my favorite logarithmic chart (and my favorite stock), which alert readers will recognize is the source for my blog's favicon. Once again, Apple earnings have exceeded expectations by some 20-25%, sending the stock up almost 7% in after-market trading, and delivering a blow to those who, fearing a less-than-spectacular earnings report, sold AAPL in the past week or so. I'd like to think this is one more example of how pessimism has been the norm. 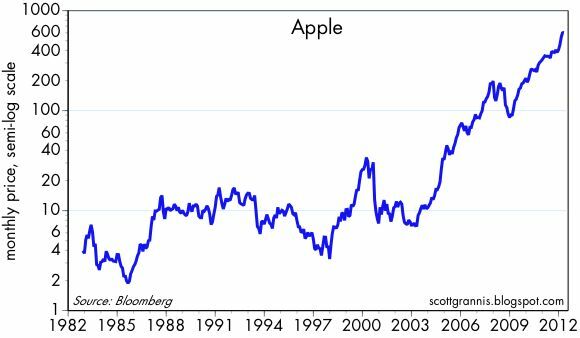 Investors have been very reluctant to believe that the U.S. economy can avoid another recession, and reluctant to believe that Apple can continue to post above-average growth. Yet Apple's profits are up 94% in the past year, and even after today's after-market gains, Apple's PE ratio is still only about average. This market still doesn't believe the good times can last. 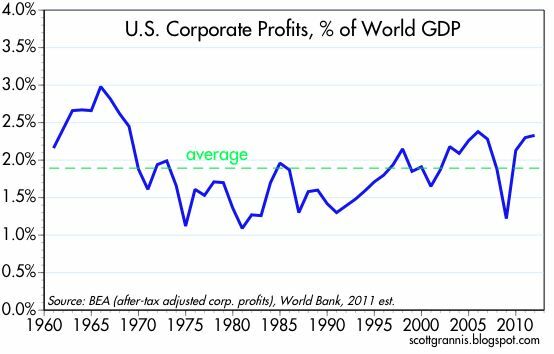 Apple is also a good example of why corporate profits are at record levels relative to U.S. GDP, but only about average relative to global GDP. The reason? Successful companies can address a global market that is orders of magnitude larger today than it was just 10 years ago. Apple can sell millions of iPhones and iPads every few days, and still have only a relatively small share of the potential global market for smartphones and tablets. If Apple can come up with just one more unique product this year—and Tim Cook today referred to at least one more to come this year—then there is little reason to think that AAPL is anything but cheap at today's price of $600. 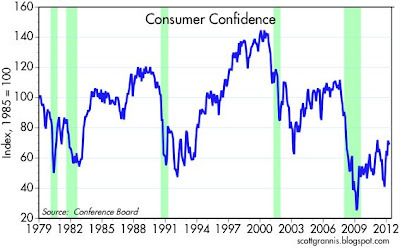 Expanding on my thoughts in the previous post, I offer this chart with the latest figures on consumer confidence. Although confidence is close to a post-recession high, it is still abysmally low from a long-term historical perspective. Nobody is very excited about what is going on in the economy these days. 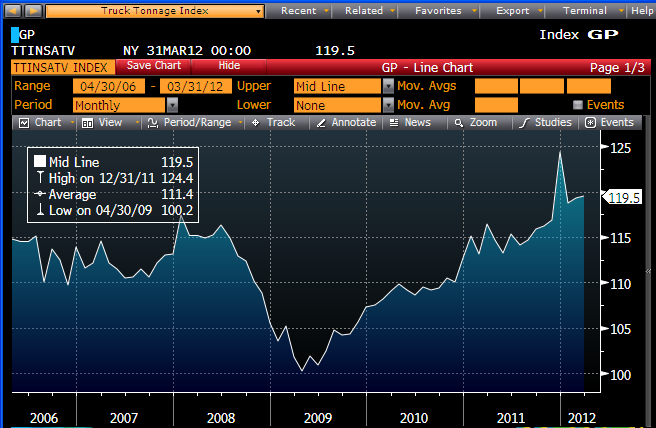 To judge from this and other things (e.g., 10-yr Treasury yields of 2%), confidence in the future is still awfully weak. In fact, today's reading on this index is consistent with—if not weaker than—the readings we saw during prior recessions. There is still plenty of pessimism out there. 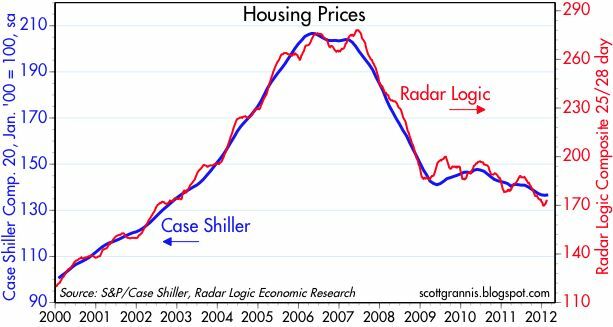 Housing prices continued to edge lower earlier this year, as revealed in the February Case Shiller and Radar Logic housing price indices. 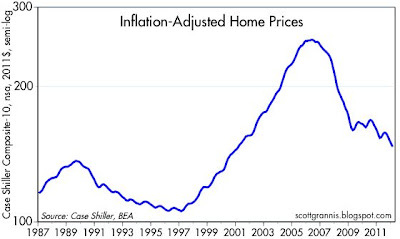 On an inflation-adjusted basis, housing prices have declined by 42% since their mid-2006 high, and are now back to the levels that prevailed in 2001. Sharply lower prices, combined with mortgage rates that are at all-time lows and rising personal incomes, make housing much more affordable that ever before for the average homebuyer. Lower prices have allowed a huge number of homes to change hands, with new buyers absorbing the excess inventory of housing that had accumulated in the wake of the housing bust. I've been thinking that prices were at or close to a bottom, but it looks like I was premature. 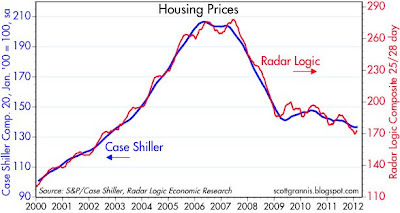 Nevertheless, I think it is clear that we have seen the lion's share of the price adjustment, and that the housing market is looking a lot more stable and attractive now than at any time since 2008. 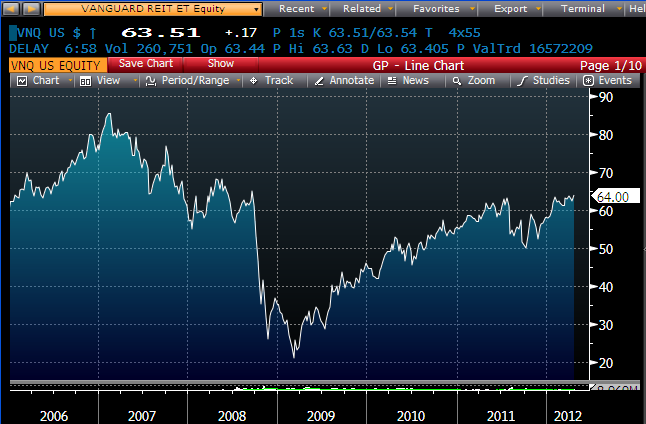 I note that the Vanguard REIT fund (above chart) has rebounded significantly from its 2009 lows, and today is only inches from its post-recession high. 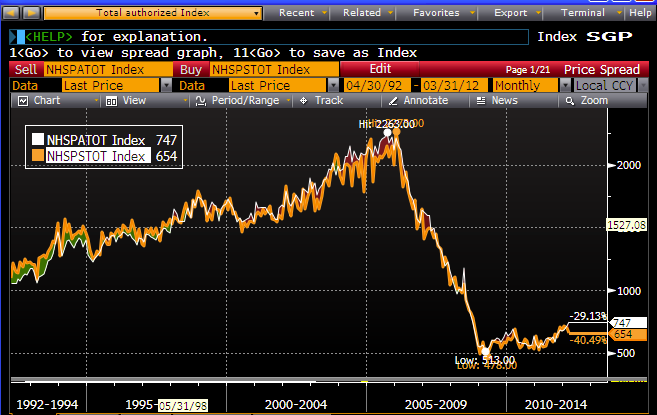 VNQ has generated a total return of 238% since the March '09 low, compared to the S&P 500's return of 117%. Avoiding the real estate market has not proved to be a profitable decision, despite the ongoing decline in prices. What this tells me is that in late 2008 and early 2009, the market way over-estimated the degree to which the housing market would eventually collapse. We haven't seen home prices rebound yet, but since prices today are much higher than the market thought they would be, this has been the equivalent of good news for investors. And so it goes for the economy. I've been bullish on the market because I have believed that the market was priced to an extremely pessimistic view of the future. I haven't been bullish because I thought the economy would be growing by leaps and bounds; I've been bullish because I thought the economy would grow by more than the market expected, and that proved to be a pretty low hurdle. Since the future has not turned out to be as bad as everyone thought it would be, valuations have improved. And since 10-yr Treasury yields are still at a miserably low level (2%), I think the market is still priced to an awfully weak economy (e.g., another recession) going forward. So you don't have to be very bullish on the economy to be bullish on equities. If the U.S. simply avoids a recession and continues plodding along at a very modest rate, that could be good enough to drive further gains in equity prices, and eventually some significant declines in Treasury note and bond prices. 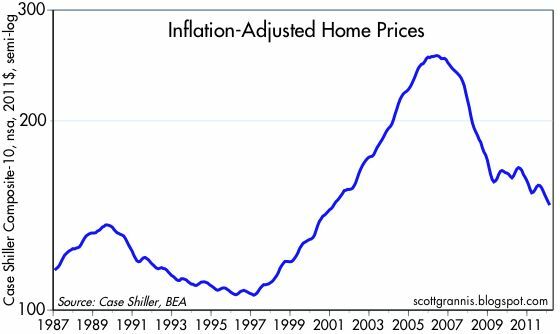 Another way to look at this: lower home prices are not necessarily bad news. What's important is whether markets continue to clear, and whether the economy's scarce resources are being put to more productive use with the passage of time. So far, this looks to be the case. That's the title of Mary Anastasia O'Grady's column in today's WSJ. After reading it, I realized I didn't need to come to Argentina to find out what's happening here. Most Argentines seem clueless about the what the YPF seizure is really about, even though most of the folks we know agree that what Madame President Kirchner has done is really not right. Here's the YPF story in a nutshell: after privatizing YPF in the late 1990s, the government imposed a price ceiling on the oil that YPF sold that ended up being way below the world price; that price ceiling greatly reduced YPF's incentive to find and produce more oil; finally, the government decided that since YPF was not finding and producing enough oil, it deserved to be once again nationalized. One suspects, thought there's no proof, that lots of money changed hands behind the scenes, and not in ways that disadvantaged Ms. K.
Most Argentines never hear this side of the story, however, and end up believing the government's spin—that YPF was a greedy multinational that only wanted to milk Argentina's resources for all they were worth, with no thought for the well-being of the country. After a series of conversations with friends these past few days, in which I relate to them what has been happening in the U.S. under Obama, I have been struck by their almost universal response: Obama is doing the same things as the Kirchner administration! Rig the rules of the game, give handouts to favored industries, financial backers, and unions, blame the rich and the big corporations for the failures, pit the rich against the poor, make every attempt to tax the rich and redistribute the wealth, avoid all mention of the disastrous financial results (e.g., trillion dollar deficits in the case of the U.S., and capital flight and double-digit inflation in the case of Argentina), and meanwhile live like a King (or Queen in the case of Cristina). We can't afford much more of this, and neither can Argentina. Beautiful day in Buenos Aires. We're staying in the trendy and quaint Palermo Soho district just a few miles from the heart of the city. Lots of boutiques and restaurants. Time to go out for lunch. We're on our way to Argentina today for a few weeks. I'm looking forward to catching up on all the crazy things the government is doing to try to avoid another big devaluation. I'm also interested to know how the government plans to run YPF better than Repsol has. Before YPF was privatized in the 90s, it held the honor of being the world's most inefficient oil company, thanks to mismanagement by a series of peronist governments. It's deja vu all over again, it seems. In any event, we'll be seeing lots of friends and family and enjoying good food and wine in the process, so blogging may be light for awhile. 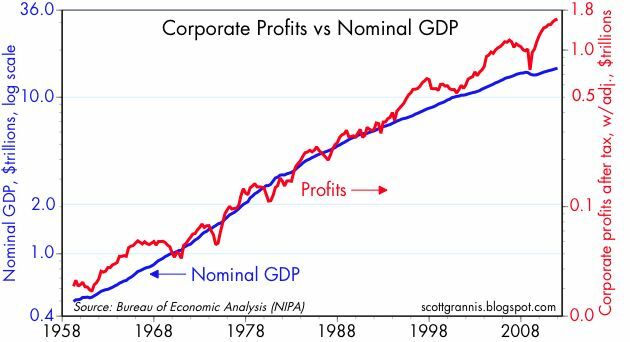 Here's an updated version of a chart that I've followed for decades. What it tells me is that the Fed is in the process of repeating past errors, since they almost always react to developments in the economy rather than being proactive. 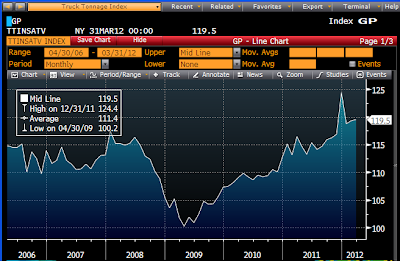 In short, the Fed is way too easy today, and this portends higher inflation in the future. Capacity utilization (blue line) is arguably a good proxy for the strength of the economy. The stronger the economy, the higher the utilization rate of factor capacity. 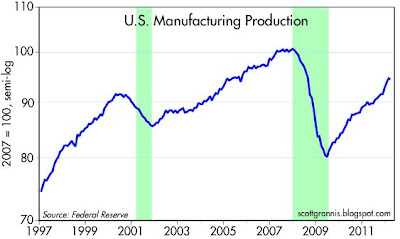 (It's a flawed measure, I'll be quick to admit, since there is no way the Fed can actually measure the factory utilization rate—they have to make all sorts of assumptions and estimates to arrive at this number. 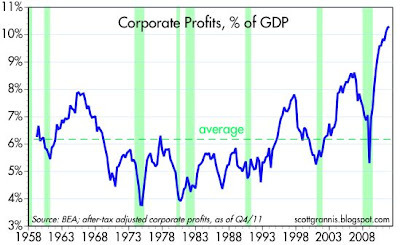 But nevertheless it does seem to track the business cycle reasonably well.) Whatever the Fed might say about what guides monetary policy, the evidence suggests that the strength of the economy is an extremely important input. The real Federal funds rate (red line) is arguably the best measure of how "easy" or "tight" monetary policy is. 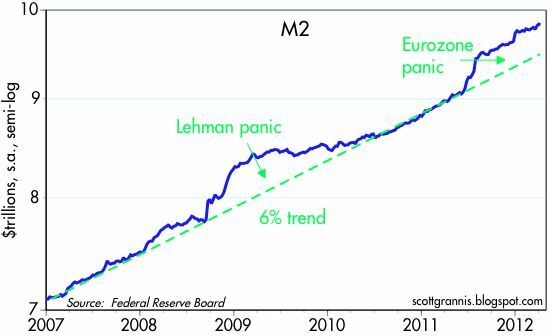 High real rates tend to increase the demand for money and slow the growth of the money supply, and if the Fed tightens enough, a relative scarcity of money develops which usually precipitates a recession. At the same time, the scarcity of money tends to pull down inflation. That's why inflation usually falls during and after recessions. As the business cycle matures, inflation tends to pick up because the Fed is slow to react to changes in the economy (note how the red line almost always lags the blue line). 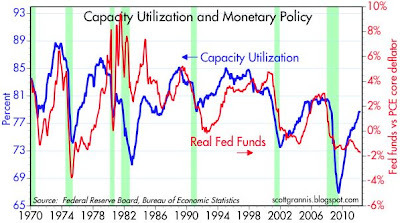 What the chart is telling us now is that there has been a significant improvement in the health of the economy (the rebound in capacity utilization in recent years is unprecedented) but the Fed's monetary policy stance continues to be about as "easy" as it has ever been. Rarely has the Fed failed to respond for so long to a significant improvement in the economy. This suggests that the Fed is "falling behind the curve." 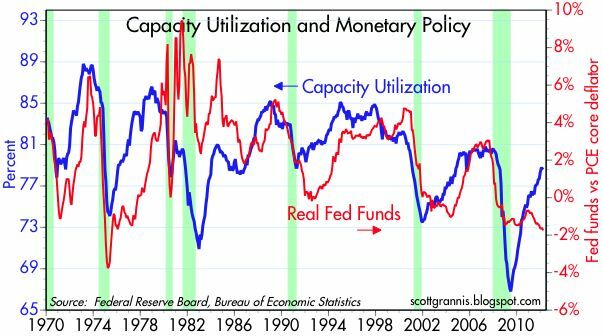 We saw a similar situation in the late 1970s, when capacity utilization surged but it took the Fed several years before it got the nerve to push the real Fed funds rate above zero. 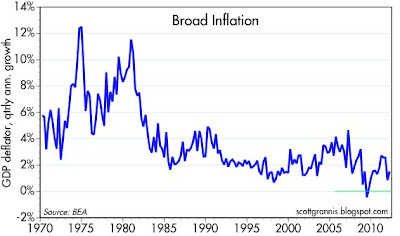 One result of this delayed reaction, we now know, was that inflation accelerated significantly, rising from 5% in 1976 to a high of almost 15% in 1980. There are other troubling similarities between then and now: the dollar was very weak in the mid-1970s, commodity and gold prices were soaring, and Treasury yields were generally lower than the rate of inflation (i.e., real yields were negative across the yield curve). I would also note that there were a few times in the past several decades when monetary policy became exceptionally "tight:" in the early 1980s, the Fed pushed the funds rate well above the rate of inflation, and they did the same in the late 1990s. Both periods were characterized by a subsequent and substantial decline in inflation. To summarize: Monetary policy is very powerful, but it works with a lag that can amount to several years or more. (I should know, since I have been making this same forecast for the past three years. In my defense, I note that inflation today is much higher than it was expected to be three years ago.) The Fed is fallible, and usually reacts to events rather than being proactive. The Fed once again appears to be making a mistake by keeping interest rates very low for too long, even though the economy is improving noticeably, the dollar is very weak, and commodity prices are generally quite strong. As a consequence, inflation in the years to come is likely to be higher than the market expects (current inflation expectations embedded in TIPS and Treasury prices are 2-2.5%), than to be lower. 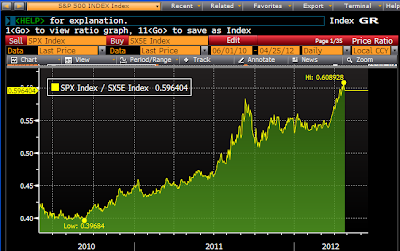 I've argued for a long time that it is too late for investors to seek inflation protection in gold. I think gold at current prices has already anticipated the likely consequences of the Fed's overly-easy monetary policy stance, and I think gold also reflects a substantial premium that investors seem willing to pay for protection against geo-political risk (e.g., the Eurozone sovereign debt crisis, which might destroy the euro, and the ongoing turmoil in the Middle East). Moreover, I think gold would react very negatively to even a hint that the Fed is going to accelerate its plans to raise interest rates. Cash is hardly a safe haven these days, since it currently offers no yield, whereas the earnings yield on equities and the yields on corporate bonds provide substantial cushions against downside risk. And of course, if inflation proves to be higher than expected, then the purchasing power of cash will deteriorate significantly. Cash could prove to be the world's worst investment in the years to come. 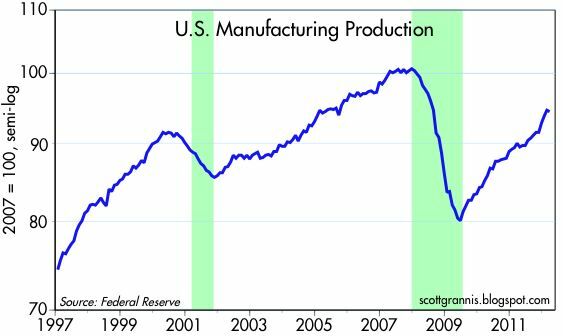 March industrial production and manufacturing production came in weaker than expected (production was flat and manufacturing declined by 0.2%). 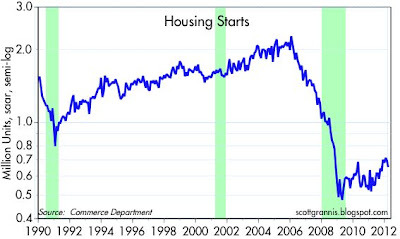 But as with the case of housing starts (see previous post), this is not a reason to think that the U.S. economy has taken a turn for the worse. No series ever moves in a straight line, and although first quarter industrial production was weakened by unseasonably warm weather which sharply reduced utility output, industrial production still rose at a 2.8% annualized pace in the first quarter. Abstracting from utility output, manufacturing production rose at a 7.1% annualized pace in the first quarter. This is robust growth. The charts above should make it clear that the trend in both is clearly upwards, and it's impressive at that. Industrial production is up at a 4.7% annualized pace over the past six months, and manufacturing production is up at a 7.4% annualized pace. 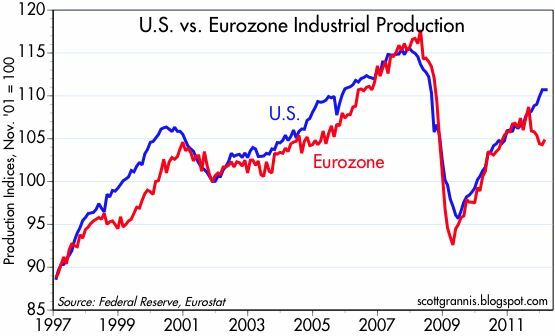 Moreover, U.S. output has far outpaced European output over the past seven months, which has suffered from the fallout from the Eurozone sovereign debt crisis. March Housing Starts came in below expectations by a sizable amount, but I don't think that's a reason to think that the nascent housing recovery is dead. To begin with, March starts were still 37% higher than their 2009 all-time low, and still 10% above a year ago. Second, starts are a volatile series, and seasonal factors can contribute to that volatility in the winter months when starts are typically low. 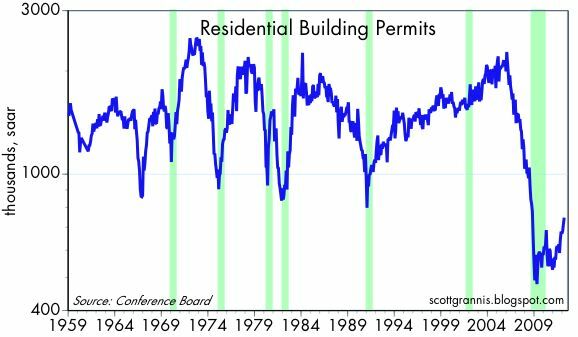 But this chart of Building Permits helps clear things up. 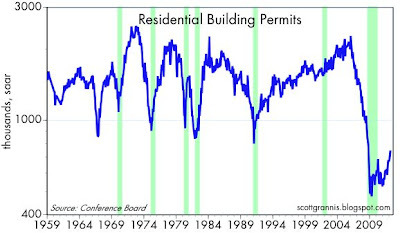 March Permits were well above expectations, and as the chart above shows, they are on a tear—up 46% from their 2009 low, and up 30% from a year ago. Seasonal factors have probably distorted this number as well, but between the two, the picture is still one of recovery. After all, permits come before starts. Permits and starts track each other tightly over time, and you can see that in the last chart, with starts in orange and permits in white. In my view, there is no doubt that the housing market continues to recover, even though activity is still at very low levels from an historical perspective. No matter how you look at the numbers, retail sales continue to rise at an impressive rate; there is absolutely no sign of any weakness here. March sales were up much more than expected, and they have posted a 6.5% gain over the past year. The top chart shows the retail sales "control group," which subtracts autos, building materials, and gasoline: it is up 5% in the past year, and is up by an even stronger 8% annualized over the past three months. 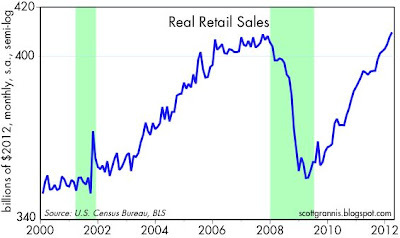 The bottom chart looks at total retail sales adjusted for inflation; this measure is up 4% over the past year and has now reached a post-recession high. Very impressive gains here, especially considering there are some 5 million fewer people working today than at the peak of the last business cycle. I'm not worried that the U.S. economy is vulnerable to a slowdown. 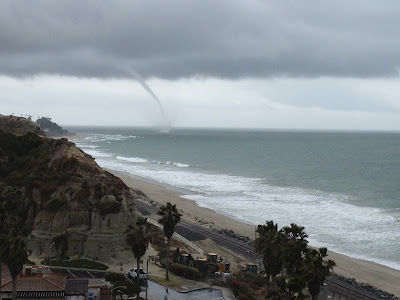 I took this shot of a waterspout that formed about 2 hours ago off Cotton's Point (Trestles Beach as the surfers call it), just a mile south of Calafia Beach, just in advance of the brunt of the storm that hit a few minutes later. Amazing. Yes, there are tornados in Southern California, only they are mostly made of water.